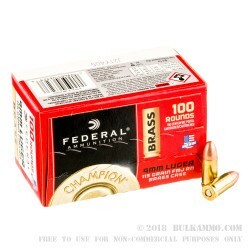 Federal's Champion brand of ammunition is intended to help shooters get out to the range and field more often with nicely priced offerings that don't skimp on quality. As such, these lightweight 9mm Parabellum loads can be expected to produce light recoil that is manageable by all shooters while also comforting shooters that are managing a budget. Federal's ammunition is made in Minnesota and backed by a long line of experience dating back to the 1920s. Other brands that they manufacture are depended upon by top-level Olympic competitors and preferred by badge-bearing professionals that can't afford room for error or poor reliability. 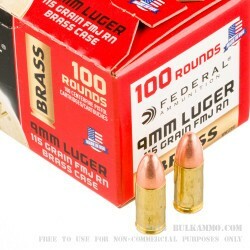 Each of these rounds finds its base in a factory-rolled brass casing that can be deprimed, cleaned, and reloaded after firing. 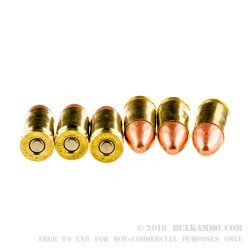 The case has a clean-sparking Boxer primer attached at its bottom and a round nose full metal jacket (FMJ) bullet at its top. The FMJ weighs in at 115 grains and shares commonality with numerous practice loads as well as some JHP options for CCW use; this will help a shooter build a relationship with consistent rhythm and sight reacquisition. 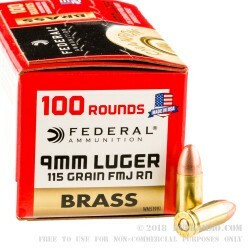 The copper-jacketed FMJ is suitable for all sorts of range work, plinking, and club-level IDPA or Steel Challenge matches.